UPTOWN — When Qaw'mane Wilson didn't show obvious grief at his mother's funeral, his cousin chalked it up to shock, that "he was just having trouble processing her death - numbed." The young man didn't sit in the front row of the church near Yolanda Holmes' casket and spent much of the service hanging outside, according to friends and relatives, some of whom found his behavior at the September 2012 funeral odd. "He just seemed a little distant. 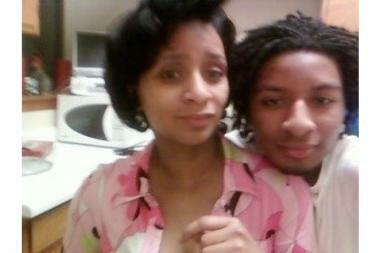 He didn't seem devastated," said Zion Banks, Holmes' first cousin and the spokeswoman for the family. "But looking back now, it's more suspicious." Prosecutors allege the 24-year-old actor, dancer and rapper — who goes by the name Young QC — had a reason for looking suspicious. Yolanda Holmes (l.) was murdered on Sept. 2, 2012, and authorities say her son Qaw'mane "Young QC" Wilson (r.) allegedly masterminded her slaying. Prosecutors say Wilson, Holmes' only child and sole beneficiary, masterminded a robbery on his 45-year-old mother that led to her death, and then emptied her bank accounts and collected life insurance policies after she was slain. After his arrest late last month, authorities said he told detectives he set the robbery up for "financial gain." Friends and relatives say he began flaunting his wealth after the murder, even throwing stacks of cash to his "fans" in a parking lot and posting video of the stunt on YouTube. The loss of Holmes stunned the Uptown neighborhood. The North Side resident was a popular, community-minded figure who handed out school supplies to area children, hosted back-to-school parties and ran the busy Nappy Headz Salon, a beauty shop formerly at 4141 N. Broadway. The next hearing in Wilson's case is Monday, when two friends prosecutors said were involved in the crime on Sept. 2, 2012, also will appear. They are Eugene Spencer, 22 — who allegedly stabbed and shot Holmes to death on a Sunday morning after a phone call from Wilson awoke her — and 23-year-old Loriana Johnson, accused of driving Spencer to Holmes' apartment in the 1000 block of West Montrose Avenue for the slaying. Wilson, who is being held at Cook County Jail without bail, has not been indicted, so he has not had a chance to enter a plea in the case. No defense attorney has filed an appearance in court on his behalf, a review of court records found, and none of his family members could say whether he had secured an attorney. The Cook County Public Defender's Office, which represented Wilson at his bond hearing, did not respond to requests for comment. Wilson did speak out about his mother's death a year ago, outside Hadiya Pendleton's funeral. "My mother, she was a neighborhood woman. 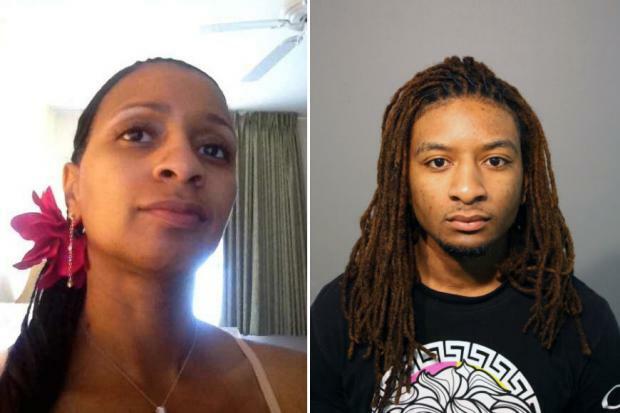 A guy entered her home and murdered her," he told WGN News, "just to steal." While Wilson was known as a flashy guy before his mother died, his tastes grew noticeably more luxurious after she was murdered, according to his friends, former classmates, relatives and friends of his mother. One week after Holmes' death, Wilson liquidated his mother's bank accounts, collecting more than $90,000. He also was the beneficiary of two of her life insurance policies, authorities allege in court documents. Numerous pictures and videos of him flaunting his lifestyle appeared online within weeks of Holmes' murder. His Facebook, YouTube and Instagram accounts show examples of the lavish life he's lived in the last year. One Instagram picture shows Wilson at the Burberry store Downtown laying a stack of cash out in front of a cash register. Another shows him at the wheel of a Mustang holding an expensive leather Versace "Medusa Head" belt. There are pictures of him with an array of newly purchased Air Jordans. He brags about buying $1,500 puppies on social media, and tells of his luxury cars, designer clothes, guns and copious amounts of weed. There's a video of him withdrawing a bunch of cash from a bank and then throwing it in the air, sending a crowd of his "fans," into a frenzy. "I don't know how he could have been living like that before Yolanda died, because he wouldn't have had the money,” said Banks, a 49-year-old resident of south suburban Flossmoor, who called the displays "disgusting." Her feelings are shared by many who knew and loved Holmes. A longtime friend and former employee of Holmes, Julie, who asked that her last name be withheld, said "I heard he wanted to be famous." "I was really surprised to see him flaunting all the money. It was just outrageous," said the 40-year-old Uptown woman. "He gained access to her wealth and whatever she had," charged 50-year-old Jefferson Park resident Tia Bouvi'a, another former employee and longtime friend of Holmes. "You just don't start to splurge immediately after your mother was murdered." Bouvi'a and Julie said they remember Wilson as a "spoiled” child who was well-treated by Holmes, a prominent beautician, successful business owner and active member of the Uptown community. Holmes bought her son a Camaro, kept him stocked with designer clothes and helped him find jobs when he needed help, they said. Even so, Bouvi'a said Wilson often exaggerated his mother's finances to other kids. She remembers overhearing Wilson, as a 16-year-old hanging outside his mother's salon, boasting to his friends: "I got money." "He bragged a lot that his mom had money and he was rich," she said. Wilson, 5-foot-3 and fit with soft features and well-kept dreadlocks, has been described as charismatic. Many friends and former classmates of Wilson declined to comment publicly, but some spoke under the condition of anonymity. He attended St. Mary of the Lake, a Catholic elementary school in Uptown. A former classmate described him as a "cool" guy who yearned for attention, especially from "the ladies," she said. Wilson later attended Senn High School in Edgewater. Some of his classmates at Senn said they found him to be "full of himself." Others found him funny, energetic and "down to earth." One classmate said "he was a cool dude” who "joked around and loved to dance” in the hallways. She said he even came to her defense once when another student tried to beat her up. "As long as I've been knowing him, he's always had everything he could want,” said another high school friend. She said Wilson "always had a great bond with his mom. To hear the allegations of him possibly hiring someone to kill his mother is quite shocking to me. Wilson's father has been largely out of his life for at least 20 years. Wilson's father, Jeffrey Todd Wilson, is serving a life sentence in Statesville Correctional Center in Crest Hill, Ill., for murder. The reputed West Side gang leader was arrested in 1993. Authorities accused him of setting fire to an apartment building in 1990 that killed two low-level crackhouse workers after the dealer who ran the drug den refused to pay a street tax of $500 to $1,000 a month. "She was a single parent who took so many steps to make sure he was OK," Banks said. "He grew up loved." Banks is now concerned about how Wilson's children might be affected by his potential incarceration. Although Banks knew he had at least on child, since the arrest she said she's learned of others. "I've been hearing different numbers," she said. A Chicago woman said she has a son with Wilson and called him "a great father" who recently planned their son's birthday party. "As far as his other kids, yes I did know," she said. Wilson and the woman are currently "not together, but we remained friends. And I will always be his friend no matter what he did," she said. A Wisconsin woman who said she has a 6-year-old daughter with Wilson said he always helped take care of the girl. She called him "nice, sweet and caring," but said the two weren't a couple. She said he hid "a lot of things" and did not mention having other children. As far as the murder charges, she said it's hard to imagine "he could have handled that on his mind" for so long. Wilson was Holmes' only child. She grew up in a big family with five siblings and 15 cousins. Banks and Holmes were close growing up. Their mothers, both now deceased, were sisters. "I'm really glad that both of our moms weren't here to witness this," Banks said about the circumstances of Holmes' murder. "Because that would have killed them." The 5-foot-tall Holmes was very frank, "very outgoing" and had a strong personality, Banks said. She had "a real sense of community and family in her heart." "She was the shining star of our family," Banks said. "Everybody looked up to her for direction." Holmes' relatives have "been trying to piece together our sense of family since she died." For relatives, a question remains: Where does Wilson now fit in that heartbreaking puzzle? "Qaw'mane does have a family, and he is loved," Banks said. She said she knew of no relative that had spoken to him since the arrest. "How do we move forward? We all loved Yolanda, we all love Qaw'mane. How do we move forward?"